As industry changes so do its demands. In many applications, compressed air has become active and in processes where air comes into contact with the process it serves, the quality of that air becomes critical. High technology industries demand higher quality air. To meet the exacting standards of industry CompAir has developed an outstanding range of Oil-free machines the D and DH series. Not only are they Oil-free, but Oil-less as they contain no oil at all. 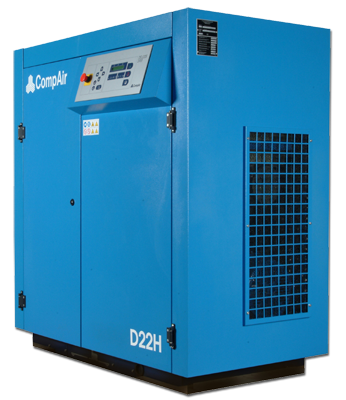 CompAir DH Series Oil-less Rotary Screw Compressors combine 100% oil-free construction and variable speed technology to provide an energy and cost efficient oil-free solution. Low operating temperatures and maintenance free sealed bearings eliminate the need for lubricating oil in the compressor. In addition to its oil-free distinction, CompAir DH Series is referred to as an oil-less line because it contains no oil in the compression chamber nor anywhere else in the package. At the heart of the compressor package is a high output single screw compression element which uses water injection technology for lubrication and cooling. Simplified construction and reduced component count decrease the number of moving parts, which drastically improves reliability. Available in both air-cooled and water-cooled options. Reliable, Quality, Value, Energy Efficient.... CompAir Oil-Free Series. 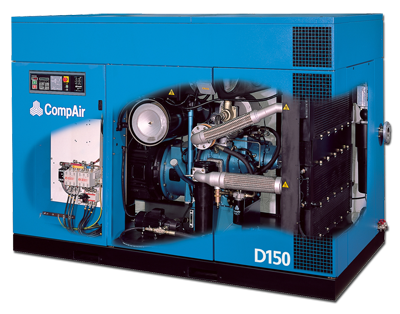 CompAir D-Series oil-free rotary screw compressors provide a reliable supply of oil-free compressed air for a wide variety of high technology industries. The compression chamber is protected against the ingress of bearing lubricant by guaranteed non-contact non-wearing labyrinth seals. The CompAir compression element design sets the industry standard for energy efficiency. Advanced asymmetrical rotor profiles and optimized radial and axial porting ensure maximum air output for decreased energy consumption. CompAir D-Series oil-free packages are fully enclosed for quiet operation and increased versatility. Engineered for serviceability and ease of installation, D-Series compressors are fully integrated with conveniently grouped service components. Nuvair is a distributor for the entire CompAir line. Visit the CompAir website compressor selector page here CompAir and find a model that matches your requirements. Once you have the model or models your interested in shoot us an email and we will quote you delivery time and pricing. The CompAir line includes: Variable Speed Rotary Screw Compressors, Fixed Speed Rotary Screw Compressors, Oil free Compressors, and Air Stations. All of these compressors are available through Nuvair.